Three diocesan priests visit the Romero Center, El Salvador during a pilgrimage to Central America. From left are Father Angel Garcia-Almodovar, pastor of St. Margaret, Reading; Father Keith Laskowski, pastor of Our Lady of Mercy, Easton; and Father Joseph Ganser, assistant pastor of St. Joseph and St. Paul, Reading. Around this time last year, three priests for the Diocese of Allentown remembered martyrs for the Church, visited shrines, administered confession and brought Christ to others on a pilgrimage to Guatemala and El Salvador. Father Joseph Ganser, assistant pastor of St. Joseph and St. Paul, Reading; Father Keith Laskowski, pastor of Our Lady of Mercy, Easton; and Father Angel Garcia-Almodovar, pastor of St. Margaret, Reading visited specific regions of Central America where Catholic bishops, priests and peasants were martyred. Father Ganser was inspired to embark on the pilgrimage to more deeply connect with parishioners who have immigrated from Guatemala and El Salvador, due to civil wars, violence, poverty and instability. “Many of them are people of deep faith. As you get to listen to them and hear their stories you begin to realize just how much the events of the various wars have impacted them. Many of them still suffer from the things they saw and experienced. We also have a few men who were conscripted during these years and are very wounded by the things they were forced to do,” he said. Realizing that to better connect with parishioners reeling from tragedy and ill-treatment, Father Ganser said he was compelled to experience – as much as possible – what they experienced. “I wasn’t disappointed. Being able to walk where my parishioners walked and lived, and seeing their culture first hand, has enabled me to reach out to them in ways that would never have been possible by remaining here in the diocese,” he said. 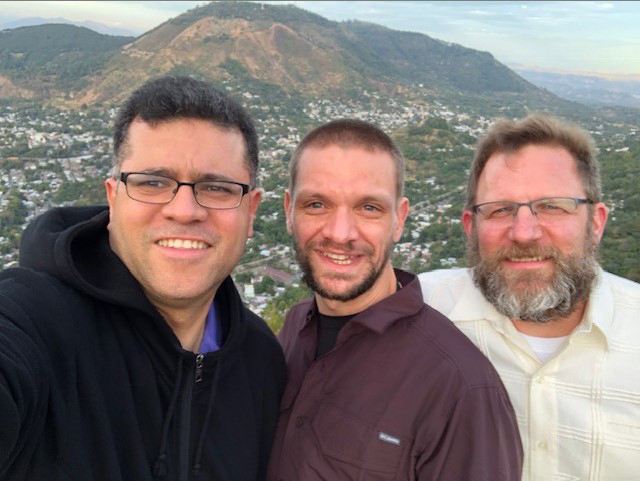 While in Central America, he said, the trio spent nearly every day visiting shrines or historic sites – and in prayer, reflection and sharing on their days without schedules. The trip was centered on three main shrines dedicated to Blessed Oscar Romero (now St. Oscar Romero after canonization Oct. 14, 2018) in El Salvador, including Mass at the altar where he was martyred and a visit to his tomb in the Basilica. “One was in the museum dedicated to Oscar Romero. It was the house located on the hospital campus where he lived. And it’s directly across from the chapel where he was murdered. You enter the house and immediately you’re presented with a man who lived a simple life, a humble life and one that was very private,” said Father Ganser. “There are few possessions. A simple room, small bed, a few clothes. But what struck me here most was his library. 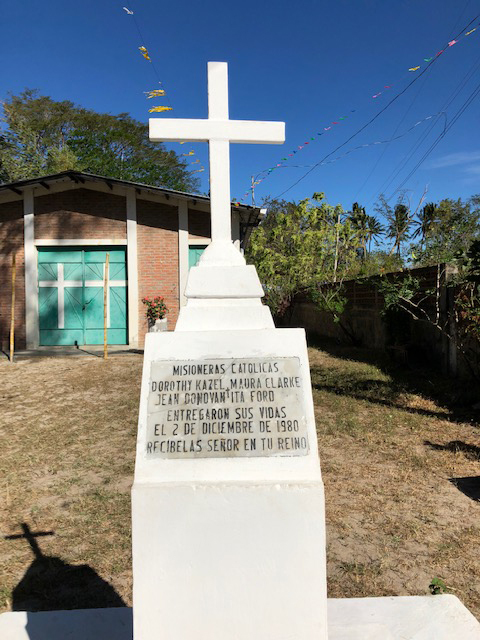 During their time in El Salvador, the priests also paid tribute at a shrine for Sister Maura Clarke, Sister Ita Ford, Sister Dorothy Kazel and lay missionary Jean Donovan, who were abducted, raped and murdered by members of the National Guard on Dec. 2, 1980 during civil war. The North American women were in El Salvador working with refugees of that conflict but were regarded as leftist by the government. “There was also a day dedicated to the six Jesuit priests who were murdered, which included a visit to their shrine at the Catholic University of San Salvador,” said Father Ganser. 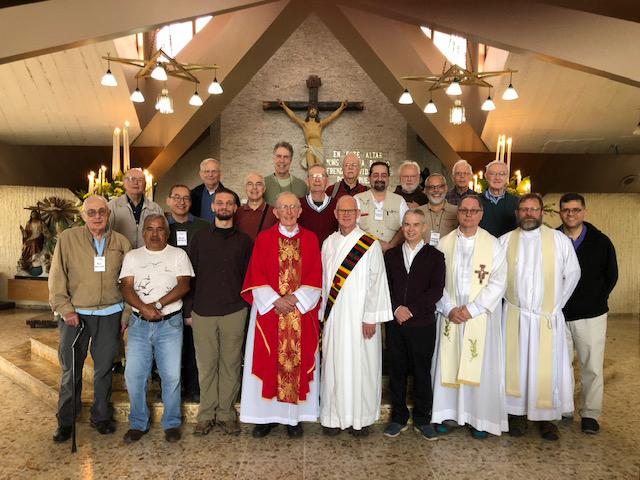 After a week in El Salvador, the priests traveled to the northern region of Guatemala to visit and learn about the newly Blessed Father Stanley Rother, a priest from Oklahoma, who ministered to the natives. They stayed in the rectory of the American priest where he was murdered in 1981. “During this time, we had the opportunity to speak to people who knew him first hand and hear the recollections of his martyrdom. We also spent one night in the rectory of the parish church where he died. The parish is still open and very active. It was here that we celebrated our main Sunday Mass with the community and then helped carry the Blessed Sacrament to the sick and the infirm,” said Father Ganser. The priests also visited the shrine for Bishop Juan Gerardi, a promoter of human rights who was attacked and bludgeoned to death in the garage of the parish house of San Sebastian Church, where he was the pastor. His assailants used a concrete slab as the murder weapon. The bishop was so damaged in the brutal attack that his face was unrecognizable, and identification of the corpse was made by means of his episcopal ring. Between visits in both countries, the priests participated in days of reflection moderated by the Maryknoll Missionary priests. “These evenings of sharing and reflection helped us to focus on the spiritual impact these sites were having on us and help us to grow and understand how we might be called at this moment to carry on the work of these saints in our ministry,” said Father Ganser. Before the daily 10 a.m. Mass, Father Ganser would rise at 5:30 a.m. to spend time in prayer in the courtyard, where he encountered a special request. “It was incredible. Even though it was barely light, the courtyard was filled with hundreds of people. And when I asked why, I was told they were here for confession. Sadly, there was only one priest available. When I heard this I just blurted out, ‘well, I’m a priest’ and immediately they found me a chair to help hear confessions,” he recalled. Moments later, he was positioned near the spot where Blessed Rother met his death. “Right next to my chair was the bullet hole in the floor where he was lying. It’s covered by glass, but the bullet and blood are still visible. It’s a very emotional place,” said Father Ganser. Ready to administer the sacrament of reconciliation, people began to form a line and he was unsure if he would be able to give them penance. “It was only then that I thought maybe this wasn’t the best idea. The younger people in the village all speak Spanish. However, many of the older parishioners prefer their own native language – of which there were many,” he recalled. “Yet, as they began to talk, I remembered the line from the gospels (Mark 16:17-19) when it says, ‘These signs will accompany this who believe. In my name they will drive out demons; they will speak in new tongues; they will place their hands on sick people, and they will get well.’ And immediately the fear vanished and things simply clicked,” said Father Ganser. He then found himself capable of understanding and did his best to respond in Spanish. “They gave every indication that they too understood. It was incredible and I can only imagine this is the power of the Holy Spirit. For here we were, people from different nationalities and cultures. We were speaking completely different languages. Yet, for a brief instance, so that we might draw closer to God we were able to speak as equals without obstacles. I ended up hearing confession for almost two hours,” he said. Relating the pilgrimage to modern persecution of the Church, Father Ganser said the phrase, “The blood of the martyrs is the seed of the faith,” resonated with him. “The people in these countries underwent terrible suffering. Many of those targeted were Christians simply because they were more visible as leaders in the communities…. Yet, they were not afraid nor did they abandon hope. And today we can see the results,” he said. 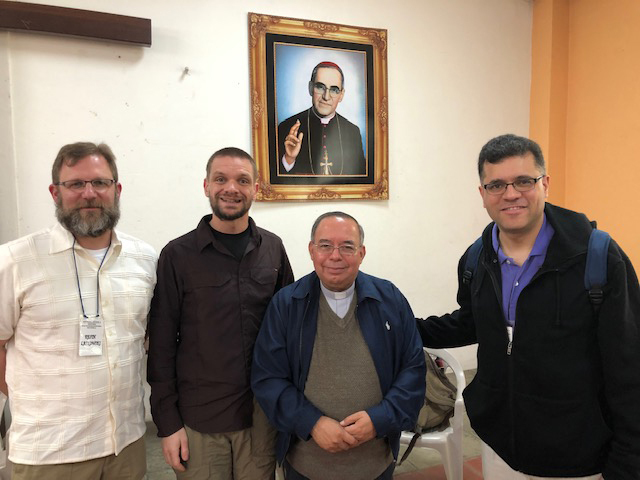 A priest for the Archdiocese of El Salvador, who knew Bishop Oscar Romero, third from left, meets with, from left, Father Laskowski, Father Ganser and Father Garcia-Almodovar. Diocesan priests and a pilgrimage group visit Divina Providencia, where Bishop Oscar Romero was murdered and shot at that altar. Father Garcia, Father Ganser and Father Laskowski overlooking the city of El Salvador. A white cross memorializes four American church women who were brutally murdered and buried on the side of the road.